Is another tankmate harassing your tang? 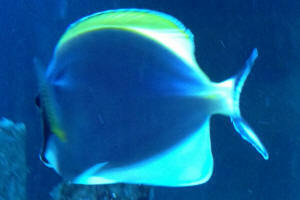 I really love Tangs; my Powder Blue is my favourite fish and is certainly doing well in my tank. He's always on the go and will eat almost constantly. He gets dried seaweed (Nori) every day and occasional frozen Mysis Shrimp and some flake foods occasionally. I worry though that the dried food isn't good enough for him -- does it have enough nutrients? Would i be better giving him some fresh spinach or lettuce as some books suggest? Of late he's developed an annoying habit of chasing one of the wrasses, at first I thought it was bullying, but i realised he was chasing the wrasse so he could eat its faeces -- is this normal behaviour or does it suggest some sort of nutritional deficiency in m y feeding regime? Well Peter, you're to be commended in keeping an Acanthurus leucosternon so happy and healthy. Most specimens dwindle in captivity, suffering greatly from capture, holding, shipping and overall processing from the Indian Ocean tropics whence all are wild-collected. Dried foods of quality are fine for this species and all others, though as you state, this Tang has a high caloric intake need. In addition to the dried algae, Mysis and 'some flake food', I strongly encourage your adding a good staple pellet food on a daily basis. My fave is Spectrum pelleted by NLS; a proven winner in terms of palatability and high food value. As regards terrestrial greens as marine fare; I'm not a fan'¦ most are of little real nutrition, and some can result in actual internal disease. I would eschew the use of spinach and lettuce (the last almost entirely a water and cellulose placebo as food). And yes re the coprophagous nature of this and quite a few other fish groups. There is nothing to worry about here. I have read that the powder blue tangs like Nori Seaweed (natural/roasted). Please advise. I am worried that my live rock does not have enough algae on it. Hello Bob, thanks for the info. A bit of a moot point now as the little bugger decided to shuffle of its mortal coil within 48 hours of being introduced to the tank. Never mind eh, the joys of a marine reef tank owner. Good morning all- I'm trying my "luck" with a powder Blue. I've done very well with tangs in the past, the only reason I'm in the market for one is that I put what was supposed to be cured live rock in my 3 year old reef tank for some fragging of xenia. Well, wasn't cured. Powder brown went down, needless to say I won't trust this shop again and I also fault myself for not taking the time to make sure and cure it myself. Sorry for the rant. The new Blue is doing well. I found a great one at the store, no scratching, eyes, skin, and color are PERFECT. He was eating spectrum pellets at store and was eating pellets and picking at rocks within 10 min.s of introducing to my tank. ( I know, no QT, feel free to slap wrist here) He hasn't yet touched the green Nori on the clip yet, will try some brown and red to see if he just prefers a different flavor. What is the best food for a powder blue. Is spectrum +A fine for the long haul? 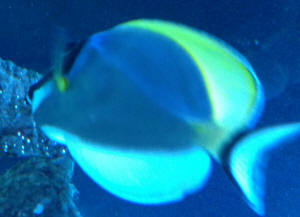 If he doesn't like Nori, what is the best Macro Algae to buy for this tang? Have you guys ever tried the ISPF tang heaven package. I have to reservations on spending 60-70 bucks for good Macro if it's the best way to go. Here in san Diego, the reef stores have been declining in quality so I'm limited as to local stuff. Your help is and always has been much appreciated. Thank you. Powder Blue Tang/Feeding...Growth 6/5/06 Hey guys and gals, <Hello Ross> Thanks for the great site, there's always something new to learn every day (whenever I'm bored at work and start browsing the FAQs!). I thought I'd share my experiences with feeding my powder blue tang. When I first got him he was painfully thin and was almost a compassion buy, I really wanted to try and bring him around. At first he wasn't eating at all, and didn't know what the heck seaweed on a clip was, so I started off with small sheets of Nori wedged in between the rocks in the tank. Eventually he seemed to get the idea that this tasted better than all the other stuff! Through time and patience he eventually realized that hey, this stuff on the clip is the same as that stuff down there, and hey presto, he started feeding from a clip. I guess all told the process of getting him to feed from a clip took around a month, there was a lot of finger crossing and hair pulling in the mean time, and it was very much trial and error. I'm a year on now, and he's grown about another two inches in length and looks downright porky, with not a hint of whitespot. <Great to hear.> Hope my experiences with leaving little bits of Nori in between rocks helps someone else wean their PB onto veggies... <Will post your experience.> My question is (he's about six inches in length now) how long can I expect him to take to grow fully? I've had him for about a year, and now he's in a 6ftx2ft2ft tank so has a bit of room to grow in. He gets an unlimited supply of seaweed from his clip as well. Just wondering what to expect in the future! <All depends on nutrition, water quality, etc. Difficult to predict. James (Salty Dog)> Many thanks, Ross.